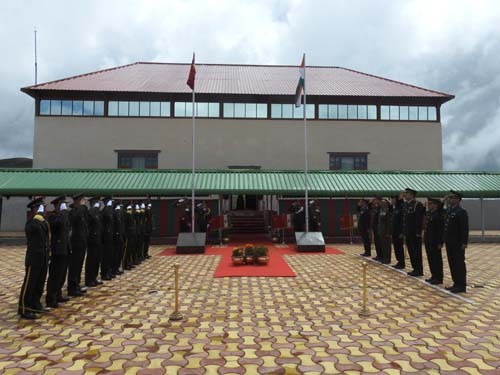 The Border Personnel Meeting (BPM) between Indian Army and Chinese People liberation Army troops was organized on Aug 15 on the occasion of Indian Independence Day at Bumla in Arunachal Pradesh. According to Tezpur base Defence Spokesperson Lt. Col. Harsh Wardhan Pande, in the last 28 years, the BPM mechanism has evolved into a vital platform for resolving local issues and fostering mutual confidence with a view to enhance peace and tranquillity in the sector. The delegation was led by Brigadier MP Singh, YSM, SM Commander of Tawang Brigade from Indian side and Senior Colonel Wu Guo Hua, from Chinese side. Located at altitude of 15,134ft and situated 42 km North of Tawang town, Bumla is one of the five designated BPM venues, between Indian and Chinese troops, he informed. The joint celebrations on Indian Independence Day started as a step towards enhancing bonhomie and cooperation between the two Asian nations.The Border Personnel Meeting was marked by unfurling the National flags of India and China followed by formal address by both the delegation leaders. The proceedings reflected a mutual desire of maintaining and improving relations along the sensitive LAC. Both delegations interacted with each other in a congenial environment. The delegations parted amidst feeling of friendship and commitment towards further enhancing mutual trust, friendship and maintaining peace along the Line of Actual Control (LAC) .